Albert Park SC have caused an early upset in the second round of the FFA Cup with a hard fought 2-0 win over Myrtleford Savoy SC on Saturday afternoon. As the 2018 reigning champions of the Albury Wadonga Football Association, Myrtleford Savoy SC were always going to be difficult to overcome. Myrtleford Savoy SC showed their class in the first half controlling most of the possession in the midfield, however strong defensive performances from all defenders notably David Ford and Garret Sheehan kept Myrtleford Savoy SC goaless and needless to say…frustrated. Head Coach “Gravy” praised his troops at half time outlining the the performance as “disciplined, organised and a team effort”, but was eager for his side to continue to look to run them off their feet ensuring the lads that a counter attack opportunity will arise when they get tired. The second half began similarly to the first with Myrtleford Savoy SC still in control of the tempo and majority off possession, however signs of vulnerablity showed as exhaustion seemed to get the better of their defense which needs to be attributed to the work rate of Matthew Novak and Michael Johnston to continually stretch their direct opponent up and down the width of the pitch. Mid-way through the half, a head clash involving Michael Johnston and the Myrtleford Savoy Right back saw Johnston needing treatment for a split ear. Albert Park were forced to play with 10 men for nearly 15 minutes while he was being patched up. 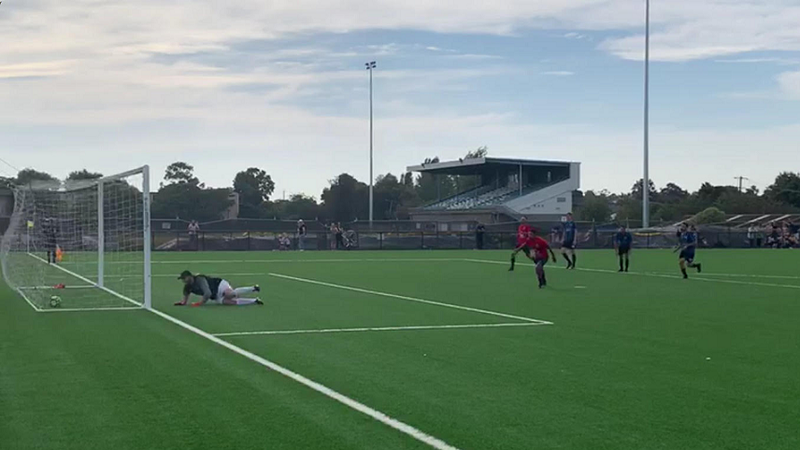 This threatened to be a pivotal moment for Myrtleford Savoy SC to capture the lead but once again Albert Park were resolute in defense and didn’t concede a goal while suffering from being outnumbered. With 15 minutes to go and still no goal, the feeling on the pitch and on the bench was that is was anyone’s game now, and with all players now on their last legs it would only take one lapse in concentration or a perfectly timed pass to break one side’s defense down…and that is exactly what happened. Myrtleford Savoy SC had over-committed them selves forward when they were dispossessed and outnumbered on the counter attack. Chris Johnston found himself free on the right wing with the ball threaded through to him with plenty of space to run and carry. However despite all the space to run with the ball, Chris Johnston caught a glimpse of one of his teammates making a perfectly time run straight towards goal on the other side of the pitch. In a moment of brilliance, vision and ball control he played a perfectly weighted first time pass through the air into the path of his teammate’s run…cue Kyle (Shearer) MacLean! Running a top speed and without breaking stride, Kyle (Shearer) MacLean reached Johnston’s pass at the precise moment the ball was about to hit the ground. Describing MacKlean’s control with his first touch as “perfect” would not be an overstatement. His ability to set the ball in motion, and at the perfect pace ahead of himself immediately took the trailing defender out of the contest and sent him through on goal. As Myrtleford Savoy’s Keeper came out, MacLean still had some work to do with the finish. MacLean shaped his body for a finesse shot towards the far post which the Keeper appeared to read, however MacLean’s finish matched his first touch and despite the Keeper managing a finger tip on the ball, it sailed into the top right and corner of the net… 1-0 Parkers! The intensity from both teams seemed to go up a notch with Myrtleford Savoy SC now dominating possession in Albert Park’s own half. Despite this, Albert Park’s defense held firm repelling countless attacks and remaining disciplined the whole time. The frustration boiled over for Myrtleford Savoy SC, resulting in conceding a penalty with 10 minutes to go. Albert park Captain David Ford confidently asked to take the penalty and slotted it firmly passed the keeper who again managed a finger tip…2-0 Parkers! Myrtleford Savoy kept coming though and with 5 minutes to go they looked to have brought one goal back only to have it ruled offside. This was the story of the game for Myrtleford Savoy as they continued to be denied their chances by a well organised and disciplined defense. The upset was complete with the final whistle wrapping up a very entertaining game that finished 2-0 to Albert Park SC. The players, coach and supporters were all ecstatic and proud of all involved. When asked about the Man of the Match, coach Gravy pointed out “Garret Sheehan, David Ford and Chris Johnston all had very good games but several players performed well and it was so hard to pick just one Man of the Match Winner. Some players were played out of their position and performed roles they normally wouldn’t be comfortable with”. In the end the MOTM went to Chris Johnston who was pivotal in the second half with his skill and creativity which ultimately lead to the first goal. Gravy pointed out many less obvious but notable performances Pete McGuire in Central Defense and Matthew Novak on the left wing who “Ran his opponent off the pitch”. There were no passengers on the day for Albert Park SC with a clean sheet one to cherish for Goal Keeper Chris Cowell who showed safe hands to deny several chances.